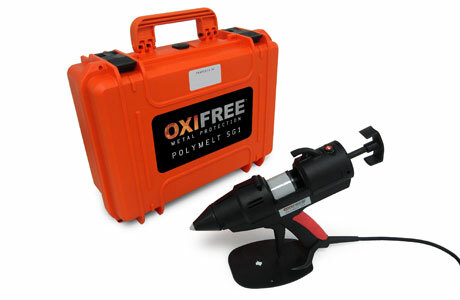 Following feedback and consultation with distributors and clients, and our own internal ongoing product development we created the Oxifree Polymelt Service Gun 1 (SG1). The SG1 fills the requirement for a small, portable handheld gun for maintenance, inspection and small touch ups. The great advantage of TM198 is its ease of removal for maintenance and inspection. An area of material can easily be cut away without causing damage to the metal substrate. This area can then allow for maintenance or simply for inspection of substrate condition. The SG1 can supply the material to refill the area resealing the encapsulation with great ease and with minimal manpower. The handheld is easily portable weighing only 1.2Kg on its own and 4.5Kg in its handy carry case. SG1 only requires a single power source and just one applicator to operate. Lightweight handheld applicator designed for TM198 re-application post costing inspection or damage. Supplied in a sealed hard case for maximum durability. Standby mode ensures applicator is not at maximum temp when not in use.